For corporate entertaining or as an incentive to your staff and customers, yachting is second to none. Southern Cross Yachting specialises in both organising corporate regattas and entertainment and conducting management training and team building courses. Whether your company is large or small we can design a cost-effective program to benefit your business. Yachting, by its very nature creates the ideal environment to develop skills in management. It is the ultimate in team activities, demanding leadership, determination, commitment and a spirit of co-operation not available in other forms of adventure based training. Yachting can be used not just as an activity to get your team working together but as an effective assessment for staff recruitment and promotion. To successfully lead a yacht safely into port participants have passed tests rarely faced in management! Southern Cross Yachting Principal Mike Job has spent several years in the United Kingdom, conducting these events for some of Europe’s largest companies and can offer the latest in sail based training techniques. The training on board the yachts can be complemented with shore based activities leading up to the event, and debriefing after. These programs are an ideal addition to sales conferences and seminars and can set the theme for major sales promotions or product launches. Southern Cross Yachting can arrange these activities for groups of any size from a ½ day to 3 full day and nights. We can arrange everything from catering to hotel rooms and flights and the costs involved are much less than you might think! Yachting makes good business sense so whether it is a fun day out or a serious training event contact Principal Mike Job to discuss an activity for your company or group. Sydney ‘Grand Prix’ 41 “Oceans”, Jeanneau 36, 40 and 45, Bavaria 45. Each yacht is skippered by one of the School’s highly experienced AYF/RYA Yachtmaster Offshore Instructors. A 5.3 RIB is available for those who would like a picnic trip to one of the many islands in Moreton Bay or to follow the racing events off Manly. Introduction to parts of the yacht and basics of sailing. Leave marina for sailing on beautiful Moreton Bay. The on water activities will focus on either sail training or team building or in the case of more than one yacht, racing! Price includes yacht, qualified skipper, fuel, insurance, and bottled water. Yacht returns to marina for de-brief. Welcome and introduction to yachting, safety brief and parts of the yacht. Leave marina for sailing on Moreton Bay. As for the 1\2 day course the focus can be on sail training or team building as each person takes it in turn to do each job on the yacht from helming to trimming the sails. The yacht anchors for lunch aboard and swimming (weather permitting!) before sailing in the afternoon and returning to the marina for de-brief. Price includes yacht, qualified skipper, fuel, insurance and bottled water. We can organise a yacht-racing regatta for numbers from 10 persons (2 yachts) to 200 persons. These events can be anything from a relaxing fun race to a serious ‘blood on the water’ contest! Includes pre race briefing, 1 hour on the water training and the race around Green Island then returning to the marina for post-race presentation. Bottled water included. 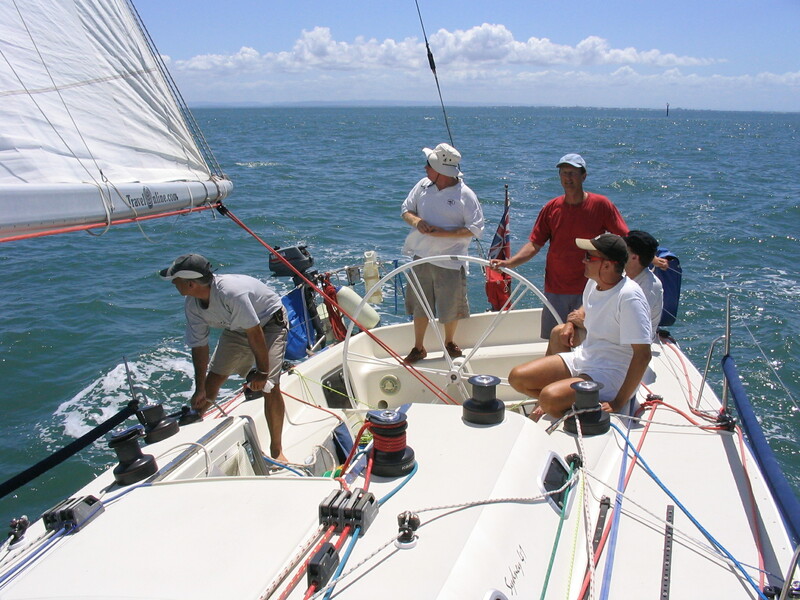 Why not treat your staff or clients to an afternoon of fun by entering a yacht in Moreton Bay’s famous ‘WAGS’ race! This race is held each Wednesday and is designed entirely for crews participating to enjoy themselves. It is a ‘pursuit’ style event with the yachts start time depending on the speed and handicap of the yacht (smallest boats start first). The school has various sized yachts available depending on the size of the group. The afternoon begins with a safety brief on board the yachts before leaving the marina for a short practice prior to the start. After the race we return to the yacht club for the presentation. Feel free to stay on for dinner. Includes pre race briefing and training in the morning with the yachts rafting up at anchor for lunch. The yachts will then complete two short races or one longer race depending on the winds and the group level of competitiveness. Yachts will then return to the marina for de-brief. $1270 per yacht (up to 9 – 10 persons/yacht) – Sydney 41, Jeanneau 36 & 40. $1455 per yacht (up to 9 -10 persons/yacht) – Sydney 41, Jeanneau 36 & 40. $1500 – Bavaria 45, Jeanneau 45. We have a 5.3 metre rigid inflatable boat which is available for charter at a cost of $700/day. A great way to travel to Peel or Stradbroke Island for a picnic on the beach or BBQ at Little Ships Club at One Mile on Stradbroke. Ideal for 6 people plus skipper. PAYMENT: Payment is required to confirm a booking. A 25% deposit is required if the booking is over 28 days from the date of the event. If the booking is within 28 days of the date of the event the full fee is required. WEATHER: The event will be postponed if there is a strong wind or gale warning or conditions that we deem to be unsafe. If you are unable to postpone a refund will be paid less a 10% booking fee, catering fees and skipper’s fees.